Being a writer in today’s world of media can be intimidating. There are so many opportunities and so many different kinds of projects that anyone could think they don’t have the tools to go from a short story to a TV show, or from a short documentary to an instructional short film. 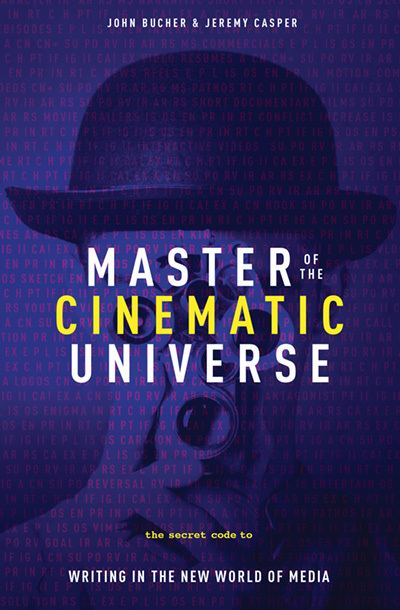 But in the book Master of the Cinematic Universe, the authors John Bucher and Jeremy Casper demonstrate that all these various forms of storytelling all share the same elements. It is then only a matter of deciding on which elements each form focuses more particularly. The first part of the book establishes these various elements, define them. It is like establishing a code and its elements to be able to use it later in defining each type of project. Examples of these elements are Pathos (related to the emotional quality of the project), Entertain (related to the entertaining quality of the project), or Protagonist (related to the protagonist of the story that is told). Then, each category of project has its own chapter and each one of them is decomposed into its key elements, and its secondary elements. For instance, if you write a narrative short film, you will mostly have a protagonist, an external goal, a conflict, and a short run time. But if you do a short documentary film, then the focus will be on informing, entertaining, and having a short run time. And so on. This book brilliantly helps to clarify the differences between the various kinds of projects, and to become aware that most of them share the same basic storytelling structure and elements, but with different focuses. A very helpful book to learn to navigate easily from one type of writing project to another one.